The company behind the re-imagined New Stratos confirmed in an email today what we first reported back in July: Ferrari won't let them build it. But, they also hinted at a new, more French direction for their next car. The New Stratos was built on the chassis of a Ferrari F430 with custom carbon fiber bodywork by Pininfarina meant to evoke the spirit of the Italian original. The Germans behind the deal had full cooperation during the construction from Ferrari, with then president Luca di Montezemolo even taking the wheel for a test drive and praising the setup. That support was apparently limited to one model. The reason lies in the attitude of Ferrari CEO Dr. Amedeo Felisa, who opposes the production of other vehicles by companies that work with Ferrari. So much for Pininfarina then. It's a major disappointment for those of us looking forward to one day piloting a short-wheelbase wedge, but one with a silver lining. 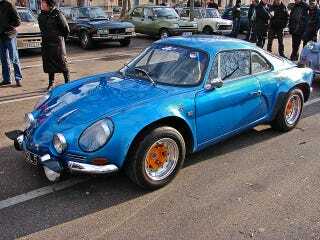 At the end of the email they mention Renault is considering letting them riff on a Renault Alpine A110 Berlinette for the modern world.